Physician Assistants support Dr. Adams during mitral valve repair surgery. The excellent physician staff is complemented by a staff of nationally certified (NCCPA and AAPA) and registered Physician Assistants. These health care professionals are licensed to practice medicine with physician supervision. As part of their responsibilities, The Physician Assistants conduct physical exams, diagnose and treat illnesses, order and interpret tests, counsel on preventive health care, assist in surgery, and write prescriptions. Our team of Physician Assistants works closely with each of the surgeons to deliver complete and comprehensive care. 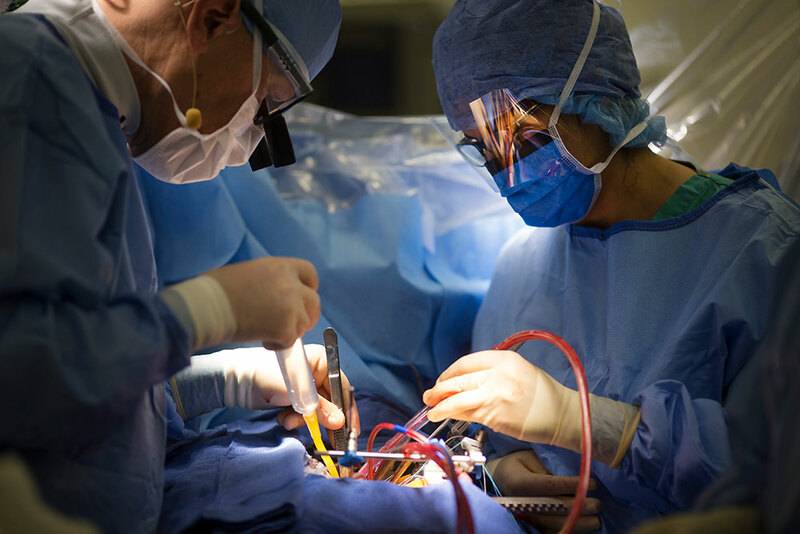 These dedicated individuals are involved at all stages of care, examining patients before surgery, assisting with the surgery, and are instrumental in the post op care to recovery. These inspiring individuals play a proactive role in the patient’s recovery giving them the positive reinforcement and motivation to get back to normal pre-operative activities. Patients can take comfort know that a member of this team is available 24 hours a day and 7 days a week and has a unique access to the senior surgeons. Mount Sinai Heart employs some of the most advanced and specialty trained PAs in the industry. The Team has received awards at all levels from PA organizations to industry sponsors and include a recipient of NYSSPAs “Presidents Award” as well as Guidant’s “EVH leadership gold circle awards”. The Physical Assistants continue to be updated in the latest trends and receive the latest training available. Our current team is skilled in techniques such as endoscopic harvesting of the saphaneous vein. A procedure that has eliminated a long leg incisions when harvesting the saphaneous vein for coronary bypass surgery. With this technique the vein is harvested through a 1 inch incision and has proven to quicken recover time. Presently more than 95% of leg vein harvest is done by this minimally invasive technique. Our Physician assistants are active in national, state and local organizations and are involved in PA education, holding adjunct faculty positions at local PA programs. This group currently has a series of articles pending publication. The PA’s extensive experience working on complicated cases with Dr. Adams, Dr. Filsoufi and Dr. Anyanwu has lead to a truly unique relationship in the OR that has been described as a dance. These competent extra set of hands keep the operations moving smoothly, like a well oiled machine, never missing a beat, anticipating all the moves. To help serve the medical needs of New York’s diverse communities Mount Sinai Heart has taken extraordinary effort to build a diverse Physician Assistant staff. We boast a team which includes individuals that are fluent in Russian, Polish, Hindi, Farsi, Spanish, Korean, Greek and Tagalog. Our PA’s come from the surrounding New Jersey, Long Island, Westchester, and Connecticut suburban communities as well as Brooklyn, Manhattan, and Queens communities. We pride ourselves in having a team with varied ethnic backgrounds including Jewish, middle-eastern community, Indian, Greek and Philipino Community. At Mount Sinai Heart we believe that a patient’s ability to relate and communicate to the practitioner is a key to their comfort and recovery. Thes physician assistant are happy to answer your questions and can be contacted through our office staff.